If you follow me on Twitter or Instagram then you’ll know that I’ve just got back from a 3 week honeymoon in Florida and Barbados where I built up a pretty awesome tan, even if I do say so myself. Now that I’m home, I really want to preserve my tan as much as I possible because I love the golden colour that my skin goes when I have a natural tan. In order to make my tan last as long as possible, I have been moisturising my skin morning and night using the Liz Earle Energising Body Lotion each morning and the Lancaster Tan Maximiser every other night. 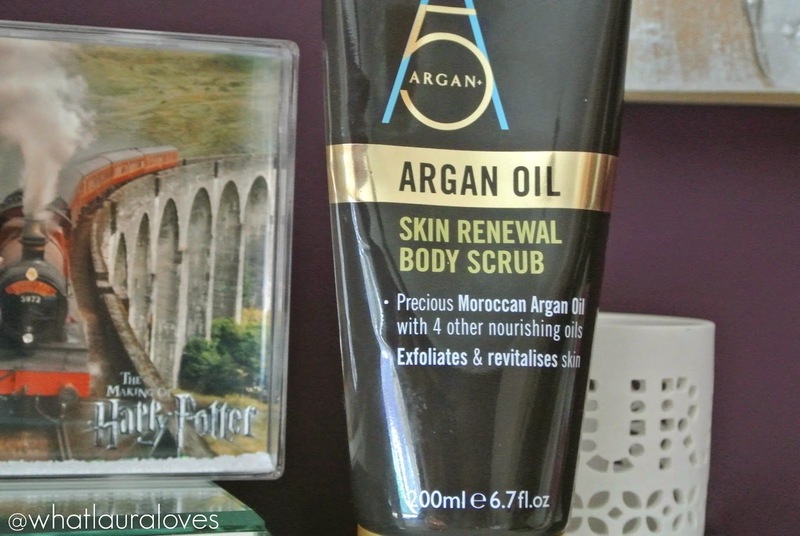 Also every other night, I have been exfoliating in the bath using the Argan+ Skin Renewal Body Scrub. I’ve used Argan+ products in their past and I absolutely love them. Their Dry Body Oil (review here) is a personal favourite of mine as it leaves my skin feeling really nourished without feeling greasy or clogged up- love. So needless to say, I had high hopes for their body scrub. 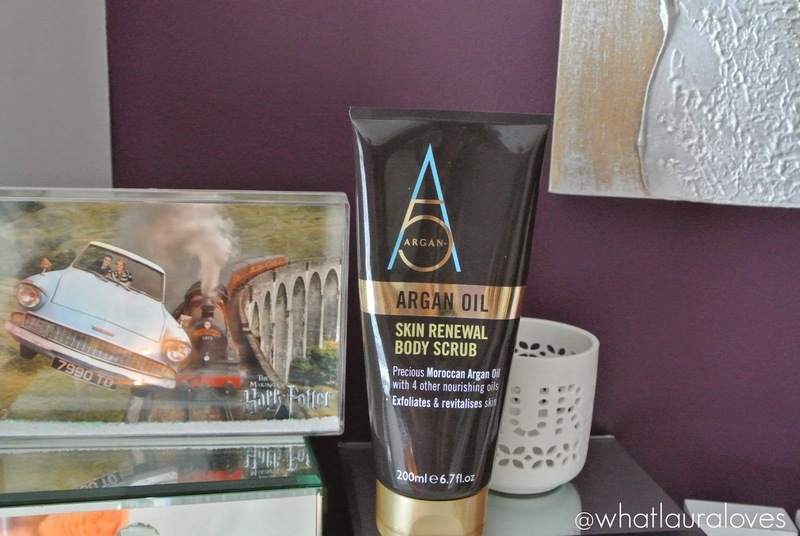 The Argan+ Skin Renewal Body Scrub is an abrasive scrub set in a luxurious cream. It isn’t harsh at all and the exfoliating particles are finely milled enough that they slough away the dead skin from my body effectively. I sometimes find that body scrubs that don’t have fine particles in them don’t actually work, they just scratch at the skin. The abrasive scrubbing bits in this body scrub are made up of crushed olive stones and pumice, creating a natural exfoliator that really gets rid of the dull, lacklustre skin and impurities. I can really see how effective it is because my skin has been a lot drier with being sun drenched and because I have a tan, I can see the white cast that the dead skin cells leave on my arm, especially in areas where I’m peeling a little and so after I have used this body scrub and my skin looks healthy and glowing, I can really tell that it has worked. Another great thing about this body scrub is that it actually moisturises the skin and softens it as well. Remember that luxurious cream I told you about? Well it’s made up for 5 precious African oils, including Sacha Inci, Moringa and Kukui, which have each been selected for their restorative, regenerative and nourishing properties. There’s Argan Oil in there which is a particular favourite of mine as I have so many products that have it in. Argan Oil is great because it is rich in essential fatty acids which help to intensely nourish the skin to overcome dryness and it helps to prevent the loss of elasticity within the skin too, making it anti ageing. I’ve talked about having psoriasis on my body in the past, well this body scrub also contains Baobab Oil which is incredibly moisturising and has been found to help dry skin conditions such as psoriasis and eczema. Don’t worry if you have sensitive skin as I really think that this product would work for you because the oils are so nourishing, plus if it contains ingredients that help eczema then you know it is going to be pretty gentle in formula. I’ve been using this body scrub religiously for the last two weeks now and I honestly cannot recommend it enough. It has my skin glowing and my tan has really stuck around for longer than it usually does because I’m getting rid of all of the dead skin cells that make it dull and my golden tan is shining through. You know how much I love my gritty, abrasive scrubs and this product is genius as it is gritty but not overly packed with particles and yet it does a better job at exfoliating my skin than some of the other more densely packed body scrubs that I own do. I must also give a nod to the scent of this body scrub. I can’t describe the scent other than to say that it is incredible (it must be something to do with all of those oils!). If you have tried any other Argan+ products then it smells exactly the same as they do and the scent lingers on your newly scrubbed, moisturised skin too. The Skin Renewal Body Scrub is a new release from Argan+ and it couldn’t be happier that it is now available. You can buy it for £7.99 for a 200ml bottle and is available from Waitrose both online and in store and also from Feel Unique.